It is with great excitement that I write to announce the release of Taylor Brady and Rob Halpern’s Snow Sensitive Skin. This is an expanded edition of the original book published by Michael Cross’ Atticus/Finch and contains a new introduction by Michael, a selection of correspondence between Rob and Taylor during the writing of the project, and an extensive afterword by Taylor and Rob. The body in war-time; the time of war and of labor; “one vibration in both plane and flower”—Snow Sensitive Skin is one of the most moving and profound works ever produced out of a time of war and crisis, a must read. “Snow Sensitive Skin is our most comprehensive document of poetics and poetry on both the 'state' and the coming-into-event of wartime since Ground Work and Trilogy, which is to say it resurrects the necessarily incomplete project of Leaves of Grass. Herein is the residue and legacy of Calamus, Drum-Taps, Driftwood, Songs of Parting and more. 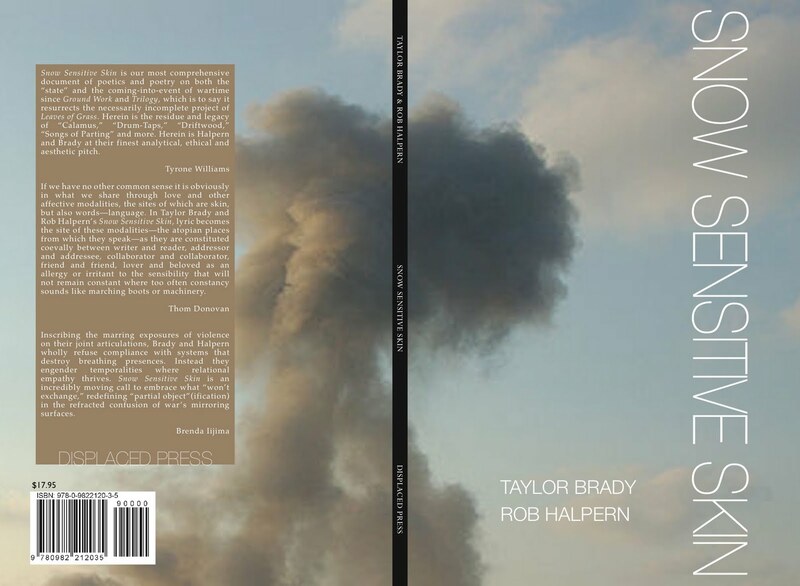 Herein is Halpern and Brady at their finest analytical, ethical and aesthetic pitch”—Tyrone Williams. As well, we would like to take this opportunity to extend a very special offer. 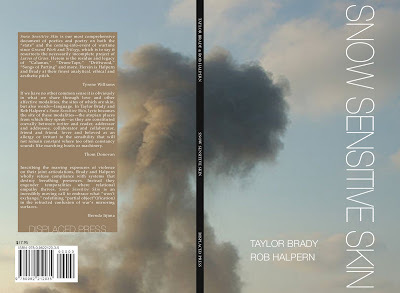 For the very low price of $50USD (shipping included) Displaced will send you: Snow Sensitive Skin by Taylor Brady and Rob Halpern, Tout Va Bien by Suzanne Stein, hurdis addo by Samantha Giles, The Persians by Aeschylus by Brandon Brown, and The Hole by Thom Donovan. You can paypal us at iwaslike@hotmail.com. Your books will ship as one package (with some special surprises of course!) once all the titles are printed (mid-October-ish). Please feel free to forward this message to your lists.